The Neptune GS-501 digital cap press is a quality multi purpose heat press. 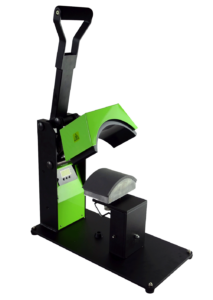 The machine offers one size heat platen and 5 lower platen options, which are all perfectly molded to mirror th curves of a hat and are designed to apply heat transfers onto cap brims and bills. This press is light and portable, making it ideal for the home use or at a retail outlet. Solid Welded Structure: State-of -art welding,which offers the machine with a strong and stable structure. presses in the market today. Curved platens: All platens are perfectly molded to mirror the curves of a hat and are designed to apply heat transfers on to cap brims and bills.